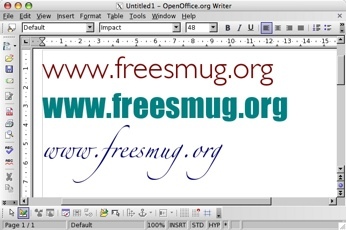 New build of OpenOffice.org 2.0 beta come with few fonts. You can add all your TrueType fonts symlinking ones in the /Library/Fonts/ folder. Remember that you can add folder path in terminal just dragging the folder you are interested in. Enter password at prompt and then launch OpenOffice. Use *.ttf for all fonts or fontyouneed.ttf for only one font. 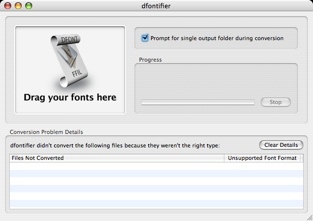 As .dfont are not used by OOo, we need to convert .dfont to Truetype an than add to OOo truetype folder. Download and install the MacOS/X package. This package will add some binaries to /usr/local/bin/ folder. 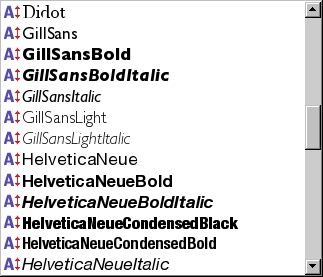 Now *.dfont are in my_ttf_fonts folder as .ttf fonts. Use *.dfont for all fonts or fontyouneed.dfon for only one font. Some fonts are in .ffil format (are ones without extension), you can convert .ffil to .dfont using donateware dfontifier and then convert .dfont to .ttf using fondu as above. 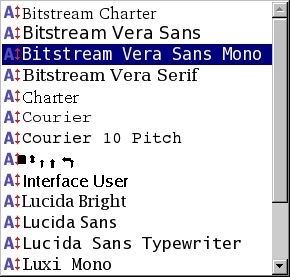 Just drag font icon on dfontifier window.